Title page from Systema Naturae, the second edition 1740. 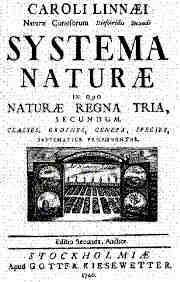 In the year 1735, when Linnaeus lived in the Netherlands, he published a book named Systema Naturae. In this book he presented a new classification for the three kingdoms in nature: the animal kingdom, the plant kingdom and the kingdom of stones. The book attracted much attention among the scientists of the time because of its important changes in classification. Especially the classification of the plant kingdom was new to the world. It followed Linnaeus’ new sexual system where species with the same number of stamens were referred to the same group. Also the animals were subjected to new classification. For instance, humans were for the first time placed together with monkeys. The first edition of Systema Naturae had only eleven pages. Linnaeus later published new editions, each time with new plant and animal species. The 13th edition was published in 1770 and comprised 3000 pages. During the work Linnaeus changed his classification. An important step was when, in 1758, in the 10th edition, he moved the whales from the fishes to the mammals. Today there is nothing corresponding to Systema Naturae. The number of species has become too large to be assembled in one book. New species are still described in the discipline Systematics, which is an important part of Biology.